12 BOXED CHRISTMAS CARDS - Inside text reads "It's beginning to feel a lot like Christmas. " As this man and woman leave the movie theatre, the man talks about how feel-good movies make life easier for him. 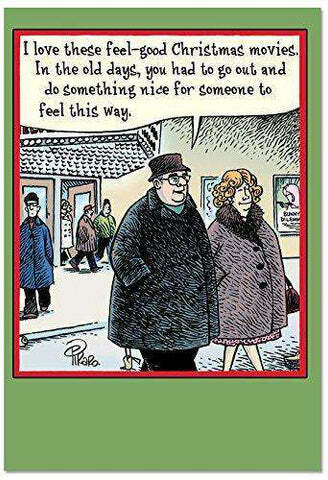 He no longer has to do something nice for people to make himself feel good. 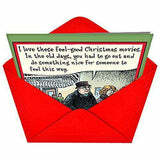 Order these funny Christmas cards today! All boxed note card sets ship with envelopes & arrive in a reusable box.